Tesla, Elon Musk, and Space X have hogged as much limelight in the recent times as an A-list Hollywood celebrity. But there’s a stark difference. Elon Musk’s endeavors are comparatively more productive and way more advanced (settling on Mars, anyone?). The latest mission of SpaceX, the Elon Musk-founded space agency, is to launch its Falcon Heavy rocket into space, send a Tesla Roadster on a cosmic odyssey and then land back safely on our planet. Where to Watch the Falcon Heavy’s Launch? The Falcon Heavy is all set to take off for its maiden space flight from the Kennedy Space Center today. You can watch the launch of SpaceX’s most powerful rocket live on the agency’s official YouTube channel. The Launch: A Landmark Achievement or a Firework Show? There is always some uncertainty and high chances of failure in space science where a slight miscalculation can burn down the whole mission. Elon Musk knows that all too well, and hours before the Falcon Heavy’s launch, he has made a witty remark to relieve the pressure and let off some steam. People [came] from all around the world to see what will either be a great rocket launch or the best fireworks display they’ve ever seen. The Falcon Heavy is basically three Falcon 9 rockets strapped together to provide a significant boost to the payload delivering capacity of a launch vehicle. 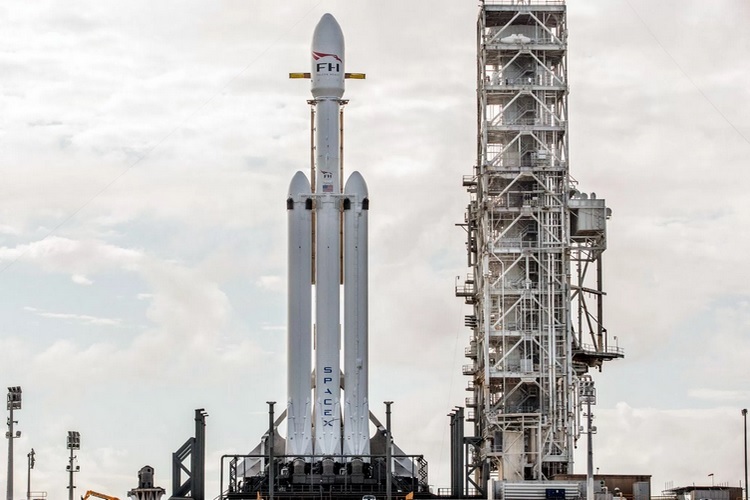 The Falcon Heavy is claimed to have twice the lifting capacity of any existing launcher in the world right now. Ok, so it is powerful and all, but what else? Well, SpaceX will also land the rockets, all three of them, back on Earth to refuel them and deploy them on future missions. It’s the biggest rocket in the world by far. It really creates a great sense of possibility if this mission is successful. The Falcon Heavy is capable of lifting a payload weighing nearly 64 metric tons, more than double of what the second most powerful launch vehicle can manage. The Falcon Heavy is set to take off for its first space voyage from the Kennedy Space Center in the next few hours, with the goal of sending Elon Musk’s own Roadster car on a space adventure (with a dummy in the driver’s seat and David Bowie’s Space Odyssey blasting on the speakers for our alien friends to enjoy).